Case clarifies rules in civil jury trials BY ALEX ROBINSON Law Times L awyers say a recent Court of Appeal decision in a medical malpractice case clarifies a number of pro- cedural issues in civil jury trials. In Surujdeo v. Melady, the Court of Appeal upheld a finding by a jury that two doctors, Don- ald Melady and Avrum Soicher, were liable for the death of Ros- sana Surujdeo, who died of a viral infection that attacks the heart just nine hours after she went to the hospital for f lu-like symptoms. The jury found that the doctors had breached the standard of care by not seeking out results from two laboratory tests. The other issue at trial was causation and whether there was anything the doctors reasonably could have done to avoid Surujdeo's death. The plaintiffs were awarded $600,000 in damages. Lawyers say the decision pro- vides clarity on a number of issues, including jury polling and instruc- tions, for cases that concern issues of causation. "The Court of Appeal decision provides guidance on so many dif- ferent areas of law and that's why it's so important," says Richard Bo- goroch, counsel for the plaintiffs. "And it clarifies specifically the causation question for the jury in medical malpractice cases." The doctors' appeal had five main grounds, which claimed the trial judge, Justice Arthur Gans, had made a number of errors. The court found that while the judge used incorrect language in one of the jury questions, there was no basis to overturn the verdict. ". . . Although the trial judge used incorrect language in the jury questions regarding causation, no substantial wrong or miscarriage of justice resulted," said Justice Da- vid Brown in the decision. "In respect of the other grounds of appeal, I conclude the trial judge did not commit the errors alleged." The appellants challenged the HATEFUL GRAFITTI Restorative justice for youth who deface buildings? P7 FOCUS ON Legal Innovation P8 See No, page 2 PM #40762529 $5.00 • Vol. 28, No.5 February 6, 2017 L AW TIMES C O V E R I N G O N T A R I O ' S L E G A L S C E N E • W W W . L A W T I M E S N E W S . C O M LAWSUIT DISMISSED Man wins legal battle over online remarks P4 BY ALEX ROBINSON Law Times T he Ontario Court of Ap- peal has upheld a deci- sion barring a Toronto firm from representing an insurance company in a cover- age dispute because of a potential conf lict of interest, despite the fact that the firm followed all ethical guidelines. In Ontario v. Chartis Insur- ance Company of Canada, the court found Douglas McInnis, of Lloyd Burns McInnis LLP, can- not represent AIG Insurance in a dispute with the provincial gov- ernment as one of the firm's law- yers, Michael Foulds, previously worked on the other side of the action. Gavin and Brooke MacKenzie, a father-daughter duo that rep- resented the appellants, say the decision injects uncertainty into the practice of law firms, as firms cannot be assured that erecting an ethical screen will be enough to protect them from disqualifica- tion. "What the court said in this Chartis case in effect was that where two lawyers on opposite sides of an ethical screen have a close working relationship on other unrelated matters, that in- creases the likelihood of inadver- tent disclosure of confidential information and that, in those cir- cumstances, compliance with law society guidelines and putting up an ethical screen in a timely way won't necessarily be regarded as sufficient," says Gavin MacKenzie. Before joining Lloyd Burns McInnis, Foulds worked for Theall Group LLP and was in- volved in representing Ontario in the dispute. Since he moved to Lloyd Burns McInnis, Foulds has worked closely with McInnis, but he has not worked on the matter. Foulds has, however, worked on other files for the company and spends 50 to 60 per cent of his time working with McInnis. The firm put an ethical screen in place, and the company filed a motion asking for a declaration that the screen was enough to pre- vent disclosure. The safeguards the firm put in place included that Foulds would See Judge, page 2 Brooke MacKenzie says firms should take note of the implications of a Court of Appeal decision that disallowed a firm from representing an insurance company. 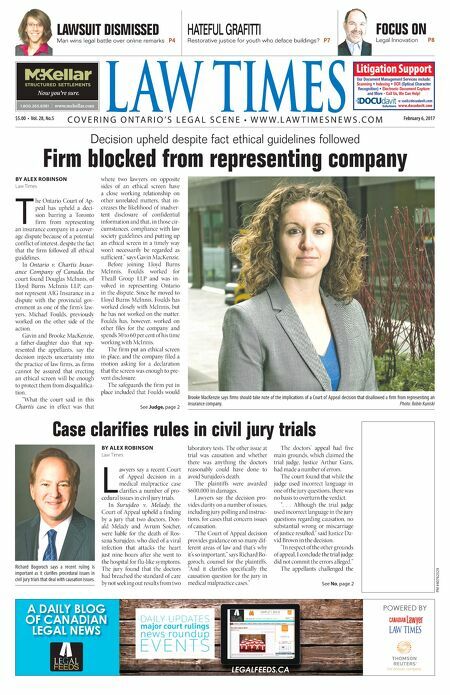 Photo: Robin Kuniski Decision upheld despite fact ethical guidelines followed Firm blocked from representing company A DAILY BLOG OF CANADIAN LEGAL NEWS LEGALFEEDS.CA FEEDS LEGAL POWERED BY Untitled-1 1 2017-02-01 9:33 AM & $#&!&jmmm$cYa[bbWh$Yec ntitled-4 1 12-03-20 10:44 AM e: ssoil@docudavit.com www.docudavit.com Litigation Support Our Document Management Services include: Scanning • Indexing • OCR (Optical Character Recognition) • Electronic Document Capture and More - Call Us, We Can Help! ntitled-1 1 2014-09-26 9:29 AM Richard Bogoroch says a recent ruling is important as it clarifies procedural issues in civil jury trials that deal with causation issues.